With printers using advanced materials capabilities, one of the more interesting ones are the metal and ceramic devices. While they are still to come, they present an interesting mix of potential capabilities. Ordinarily, these project announcement come from companies in the ceramic production field, such as Tethon3D. Now, another company is making its debut in this same field. Ceramics expert Nanoe will be unveiling their own Zetaprint desktop ceramics and metal printer at Formnext 2018. The printer uses FDM technology that the company has made compatible with metal and ceramic filaments, along with a debinding vessel and sintering furnace. The whole system will reportedly cost 10,000 euros. Along with the printer, the company will also showcase their new Zetamix Stainless steel 316L filament. The French company will be demonstrating the printer along with their debinding and sintering platform at Formnext. The company will exhibit the Zetaprint at Hall 3.0 at booth A74. 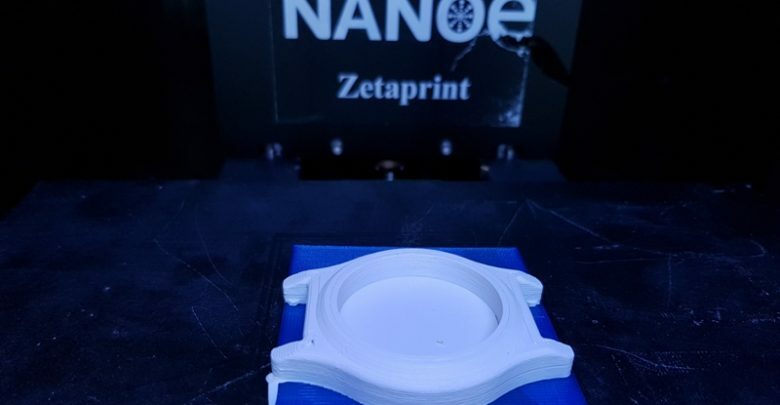 Currently, there is no metal and ceramic printer on the market, which may mean that Nanoe’s Zetaprint could be the first. While Tethon3D are working on one as well, they may end up lagging behind. Despite having a similar concept in terms of materials, Nanoe and Tethon3D are aiming for very different technologies. The former is similar to FDM/FFF adapted for ceramics and using filament, while the latter is a DLP machine. It’s fitting that they adapted FDM/FFF, as they already produce filaments that those machines can use (with the caveat that they are robust enough to handle them). As one would expect, the Zetaprint will be compatible with the company’s existing Zetamix materials. The Zetamix materials consist of polymer matrix and either ceramic or metal powder. The company already produces alumina-based filament, a zirconia-based filament and a ZTA-based filament. They are also looking into the production of materials like SiC, WC-Co, titanium and inconel are currently in development. Nanoe’s Zetaprint is looking to be a very versatile printer. The company is also launching their Zetaprint on demand service. “This service is seen as a necessary step to check the compliance of our process with our customer objectives before investing in a machine” says Guillaume de calan, ”we can deal with the full process flow starting from STL to a 3D-printed and sintered part, with some finishing if necessary”. Featured image courtesy of Nanoe.